On Wednesday of next week, a very rare and cleverly crafted platinum tiara with ties to Spanish royalty will be offered for sale at Bonhams, London. Reflecting the refined aesthetics of the Belle Époque period — the “beautiful era” of relative peace and prosperity prior to World War I — this 33.5-carat diamond tiara was designed by Spanish royal jeweler Ansorena and owned by Spanish countess Esperanza Chávarri Aldecoa, a former lady-in-waiting to Spanish Queen Victoria Eugenia, the wife of Alfonso XIII. 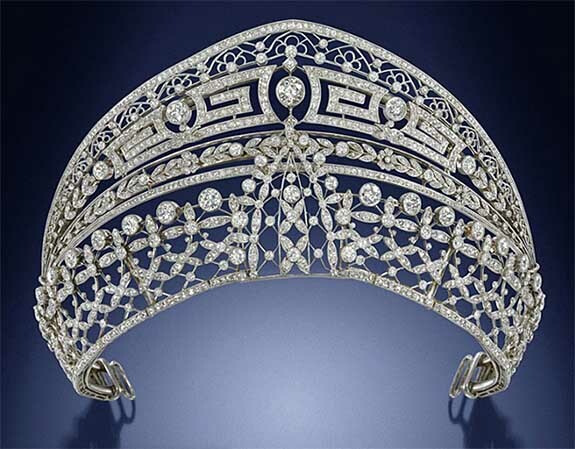 Dated to the turn of the last century, the platinum “Meander” tiara is designed as a double diadem that can be detached to form two separate tiaras, one of which may be flipped and worn as a choker. The upper band of meandering Greek key motifs, forget-me-not flowers and trailing laurel leaves represent true love and the triumph of love, according to Bonhams, while the lower band is designed as a delicate lacework lattice with central handkerchief motif, set throughout with old brilliant, single and rose-cut diamonds. The lower tiara features delicate milgrain detail and architectural knifewire tracery throughout. Bonhams is estimating that the tiara will sell in the range of $103,000 to $160,000. Bonhams reports that the tiara remained in the countess’s family for more than 110 years. During the Belle Époque period, which is conventionally dated from the end of the Franco-Prussian War in 1871 to the outbreak of World War I in 1914, women of high society enjoyed an opulent lifestyle, which included the practice of wearing tiara’s to formal festivities. 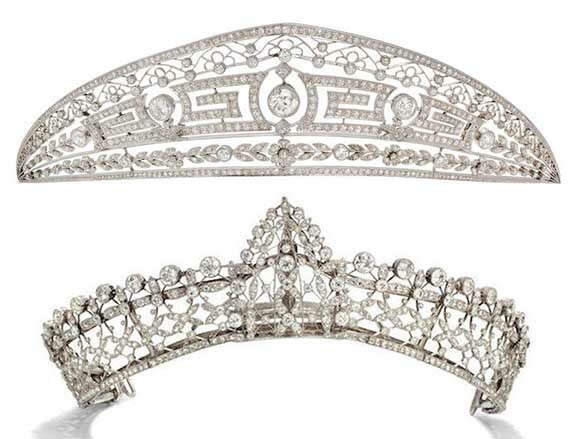 According to Bonhams, the tiara was a fashion staple and a symbol of rank. It would be worn to private dinners, balls and the opera. What’s more, the tiara was a symbol of betrothal. A new bride often received a tiara as a wedding gift to be worn later when she took her place in society. The “Meander” tiara is currently completing a promotional tour, which saw stops in Hong Kong, Geneva and New York. The final leg will be London, where it will be offered for sale on September 26.
Credit: Images courtesy of Bonhams.